Today, I would like to share past, and perhaps future stenciling ideas and stenciling projects by Debbiedoo's and more. Do you remember let's say back in the 80's when stenciling was all the rage? Well guess what, times have not changed~! Some people think it is outdated or they are not used anymore. I am hear to tell you, I am a proud stenciler. I was then, and I still am. In fact, I was just in some gorgeous model homes and there was stenciling jobs everywhere! I have been thinking about stenciling the powder room, but not sure. The toilet will have to be moved, but I want some things changed in there anyway. Got to get the mister to get through with his car and help me in the powder room. You have done a lot of nice stenciling projects and I can see the wheels turning on doing the ceiling like the one around that same light fixture. I've stenciled before, and I'll stencil again. Done just right, it's still one of the best ways to add pazazz. Oh wow, I love the photo of the stenciling on the ceiling. That would look great in your house. I haven't stenciled since the early 90s. 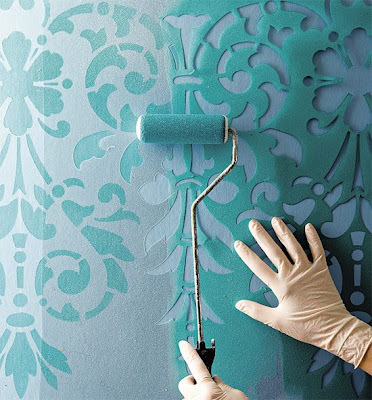 I keep seeing stenciled walls everywhere, but I don't know if it's right for my house. I love it and I was stenciling in the 80's as well. Don't even get me started! Oh...the pillows for the kitchen are to die for!! LOVE THEM! I have stenciled before on the walls and ceiling. I only have a little left on the ceiling in my master bedroom though. The others have since been painted over. I think it's a great alternative to wallpaper! Your stencil designs on your furniture look very pretty. I'm with you ~ I still like it! You've done some great stenciling and I love the walls that I've seen. The ceiling pic is beautiful ~ much more unique than a medallion, right? I like stencils in small amounts and done in a subtle manner. I too like it on the ceiling, just in softer tones. Love stencils. 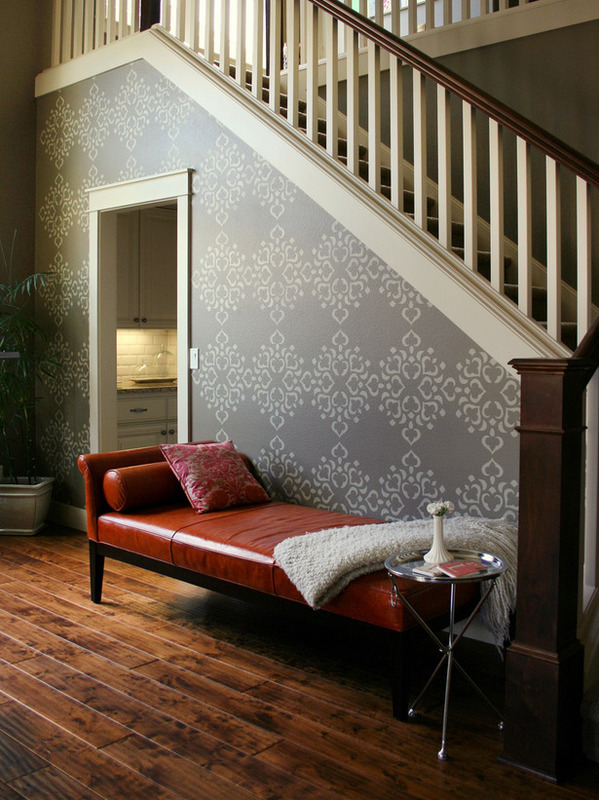 I often make my own, but have been thinking about ordering one of the big pattern wall stencils for my foyer. Great projects & beautiful images! Thanks for sharing. I did stencil,, I stenciled my 18 x 20 foot family room floor, it was beautiful.We stenciled itwith a beautiufl ivy pattern then gave 4 coats of a acyrilic floor coat,, still looked great after twenty years!I loved to stencil,, you did some great projects,, they look great that medalion idea is just amazing,, I'm in for that one! Debbie, if you want to stencil the wall, you do what my mom does. Wait until your husband is out of town for a few days. Then that will give you time to yourself to do it! Dad always says he never knows what house he will return to because he knows we have planned something we haven't told him about! I've never understood why people hate stencils. Maybe like you said because back in the day, there were so many hearts and country ones. In the right design, they are beautiful. When shopping over the past few months, I've noticed more people are buying them, so I guess the trend is picking up again. I'd love to stencil in at least one of our bathrooms, but haven't committed to a pattern yet. LOVE your stairs Debbie, not sure how I missed those. I'm going to try and talk Bama Boy into letting me stencils ours. I also want to stencil our floor or do some type of pattern on it. Thanks for sharing all the stencil eye candy! wonderful work!! love the pillow! wow! Like your stairs...very attractive! I stencil. I think it's a quick and easy way to create a new look. 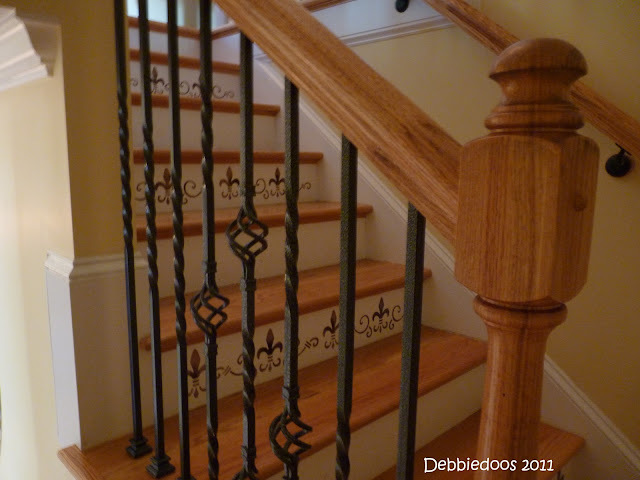 Wow Debbie I am impressed with how many projects you've done and they are all great! Love those stairs! I don't remember seeing them before- you must have more than one set of steps in there! I did a little bit of stenciling but not a lot. I have a brush that's flat that I dabbed on the paint then on a paper plate and the stomped over top of the stencil. I've never seen it done with a roller! I've been thinking of stenciling on fabric, but haven't given it a try yet. I love the pillows you did. Hi Debbie, I love to stencil. I just stenciled a table top today! If the project is finished I hope to share it on your party next week. 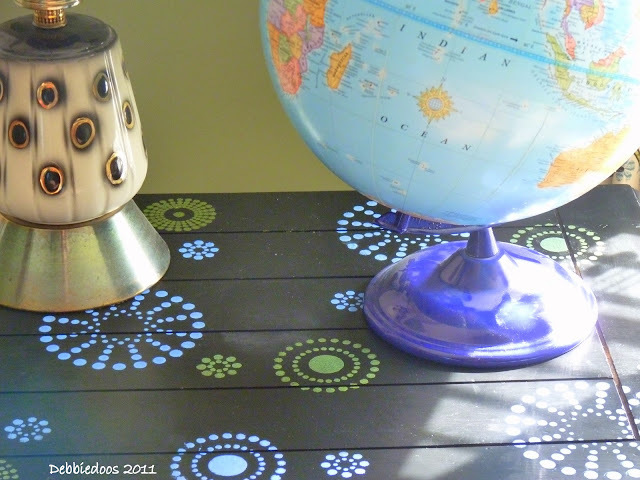 I really love your colorful stenciling on the table with the globe. My plan for this evening was to try stencilling a dresser. I guess this post confirms the plan! Hi Debbie! I love stencils done right. I have random bronze scrolls and acanthus leaves stenciled on the dining room walls. Copied it from a showhome...LOL! I stenciled some t-shirts in the 80's but nothing lately. I do love all the projects you have done with the stairs and the recipe art as two of my all time favorites! I stenciled some kitchen towels. But I have always wanted to do a wall. Sort of like the shot you have by the stairs. A tone on tone sort of thing. I like the idea of it as a medallion. It looks really pretty with that light. I was thinking about stenciling our dining room walls with a big and outrageous pattern! You've really done some nice pieces. My favorite is the kitchen measurements on the pillow and the frame. I wish I had room for something like this in my home. Wonderful pictures Deb, love the steps too! Oh, I liked you on FB! i have been stenciling since it was very uncool! I have not stenciled in a very long time. Love your stenciled furniture and pillows, heck, I loved everything you showed us. you're invited to come to my house and stencil anytime you want! I'm just about to do my first stenciling in the Steampunk Study, above the frieze. Thank you for the link to helpful tips, I really need some help! I also did stencil on the corners of my wooden dining table in the 80's. The "pens" are still with me. You reminded me I'll take out to do again on a door. I have always loved stenciling and just recently stenciled a top border in our bedroom! Great stenciling projects. You are the stencil queen, I say go for it. And look at the background on your blog, looks stenciled too! Debbie, I was another one who stenciled all the time in the 80s. I haven't done it in years, either. I love all of your handiwork, but the thing that really jazzed me the most in this one was the framed stenciled burlap. I love stenciling. I've stenciled many things. I did one wall in my daughter's room. It took hours, but the end result was worth it. Thank you for sharing all these wonderful stencil projects! Debbie, love your stenciling on the stairs and the front of the dresser - I have been playing with this idea. Such cute ideas. I loved the 80's stenciling! 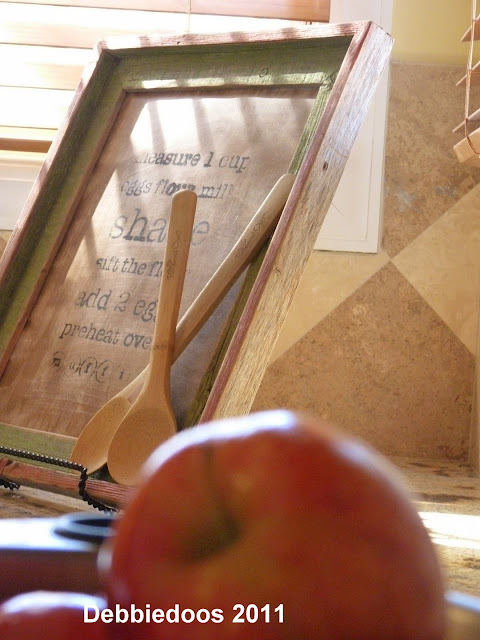 Back in the day I had a stenciled farm table and hoosier cabinet. I haven't stenciled anything in a long time! Your's looks great! 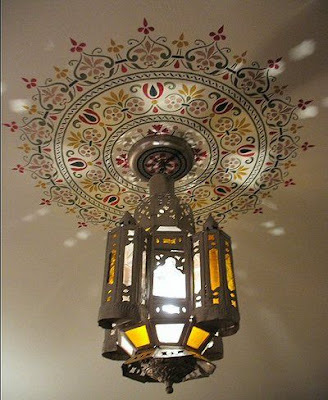 I had to take a deep breath when I saw the stenciling on the ceiling around the light- gorgeous! Your stenciling projects are so fabulous, Debbie, and I'm thinking about trying out the technique in a couple of areas in my house. BTW, I loved the '80s as well. My motto was "the bigger the hair, the smaller the hips"! I love stenciling! It is so much fun! Recently, I tried to find some at Michaels and they were discontinuing them. I was so surprised. I especially love the fabric items! You've given me some great ideas! I'm thinking about stenciling my powder room now. I really like all your projects and your stairs are fantastic. Your stencil projects are awesome. I tried one project, but it was a complete failure. Will have to try it again! I love the stair risers and the furniture! Well done! I stenciled walls in our first house, but haven't since. I may have to try it again after seeing your work. I tried to stencil once years ago. Failed. I haven't tried it since. The closest I came was stamping an image. Failed. I'm not kidding when I say I need the remedial tutorials. You might like a few things on my blog. LOVE stenciling! I haven't stenciled since the 80's! Debbie, did you buy the recipe stencil you used on the pillow ready-made or did you make it yourself? If it was ready-made, could you please tell me the source? I love the idea. Wow wee, you read my mind, I just got my stencil in the mail yesterday!!!!! I can't wait to try it out next week in the new master bath....can't wait to show you!!!! You are a stenciling pro! I love all of these ideas!